2/4/04 This should be the last part of the building pages. I'm still working on details and finishing up the boat. Sprayed the doors yesterday and should get the caning in and doors hung this week. The boat shop has been sold to the State for the new road project as expected and we will need to be out in the next 120 days at the longest. I'm still looking to launch by the end of March or first of April. I was hoping to get a slip at a nearby lake but they didn't want to rent for less than a year so we will probably take the boat to the coast instead. Debbie has a week off in April and we might do a mini cruise in the Pamlico Sound to see how everything works. I will have a travel page about all our exciting adventures when we hit the water. I'll even throw in some of the highlights and lowlights of some of our wild past adventures in earlier boats. Mostly sailboats!! Let see.........there's the one about 81 knot winds off Beaufort with full main sail up.........and the one about 7' seas in Pamlico Sound while trying to get into Oakracoke harbor and a bunch more. Stay tuned!! 2/09/04 The doors for the head, pantry and shower are up. 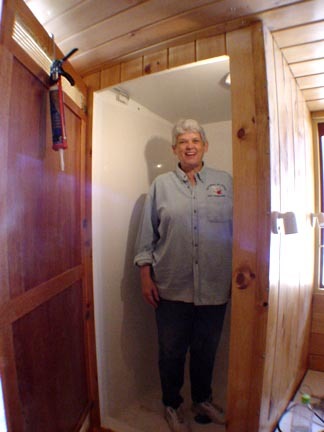 I put a caned panel at the top and bottom of the shower and head doors to help ventilation. The pantry door has caning from top to bottom. I made the head and shower doors so they would provide privicy in the back cabin when they are opened but still get some air flow over and under them. We didn't really want a curtian across the back door and because the back door will have clear glass full length we needed a way to block the view into the cabin. The shower door is the same width as the back entry. I don't see anyone getting dressed in the shower due to space so it just made sense to do it this way. 2/16/04 Debbie and I spent the weekend looking for a slip at the coast and it looks like we will be launching at Sailcraft Marina in Oriental, NC sometime around the first of April if all goes well. The prices for haul out and slips are considerably less expensive in the Pamlico sound than they are on the coast. In some cases almost half. Oriental is a nice laid back town with boating at it's heart. There are more boats there than residents! I've sailed out of Oriental many times in the past with my earlier boats and always had a good time. We borrowed a car from one of the marinas we were berthed at and when I inquired about the lack of an inspection sticker and current tag I was told "just don't leave the city limits and you'll be fine". That was several years ago but that's still Oriental. 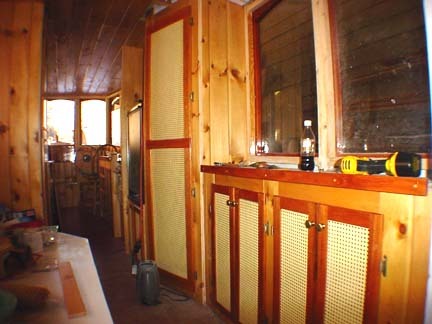 2/23/04 I finally got tired of having extension cords running out the portholes and into the shop so as to allow the heater to run inside the cabin. The 120v AC panel was installed this week along with the 12v panel and the Amp/volt meter. 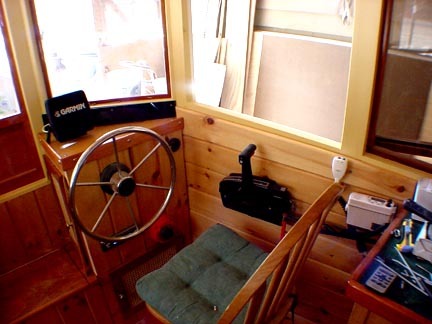 I had thought it would be nice to be able to access the 12v panel while underway at the helm but decide it made more sense to put it over the desk with access thru the pantry closet. This makes wiring a stand up afair instead of working on my bad knees in the dark behind the helm. I pulled all the wires back out from behind the paneling and will run them over the top to the panel. Most of the wires go to within 6 feet of the new location so it will work out better this way. I'm fairly adept at working with wood but electical is not my specialty. I hooked up the ground fault outlets to the panel and was feeling really good about it all when everything worked! No more cords out the portholes. There were 2 small wires attached to the AC panel that were not hooked up from the factory. Upon refering to the wiring diagram it looked like they went to the hot side and the common. I unpluged the shore power to do the conections and then turned on the juice to the panel. Low and behold I now had a reverse polarity light glowing on the panel and the only thing I had done was hook up the two little wires. If your reverse polarity light comes on, do not throw the main switch, like I did, but shouldn't have. The small puff of smoke that came out of the top of my new (and expensive) AC panel was not a good sign. I called a friend and he just happend to have a 20 year veteran Navy electrician with him at the time and said he would be by the shop later. It seems that the two small wires were for the LED lights that tell you what circuits are on and work only on 12 volts, thus the puff of smoke. To feel better about burning up the 12 volt LED lights we decided that their light would probably keep me up at night and were not needed anyway. Now I feel better! At least I know the reverse polarity light has a purpose. 3/02/04 Another March has arrived and we are close to being done. I'm still working on wiring. 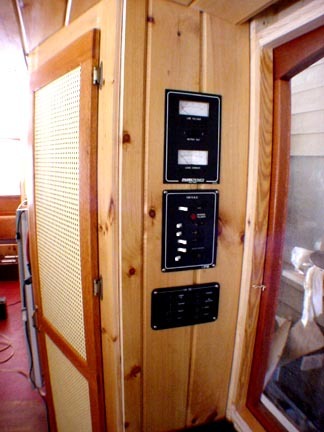 The radio was installed along with the door to the back closet. I also installed the batteries this week. We are using 4 six volt golf cart batteries wired together to get 2 banks with 225 amp hours in each bank. To get the best battery life they recommend discharging no less than 50% before recharging so that will give us about 110 amp hours per day to play with and about 2 days before we would need to run the generator or plug into a dock. The solor panels will give some of that back so it might be 3 days without recharging. The charger went in and every thing is working so far. Bob Stofko gave me enough teak to make the bow platform so that will be next. Thanks Bob!! The cushions for the galley seats should be back from the upolster's soon and Debbie is getting a price on the cushions for the back deck seats. Warm weather all this week should make for some better progress. Come on Spring time!!! 3/9/04 Lots going on at the boat yard. 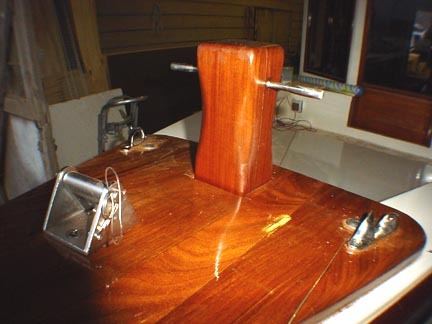 I glued up the bow platform with anchor roller and got the hand rails on top of the cabin almost installed. The bow platform is turning out really nice. I have 4 coats of varnish on the teak so far and it really shines. I'm working on the bed area now as well as a hundred other details. The shop is now the property of the state and we will have 90 days to vacate. After owning it for 22 years it will be sad to see it go but every thing has a purpose. 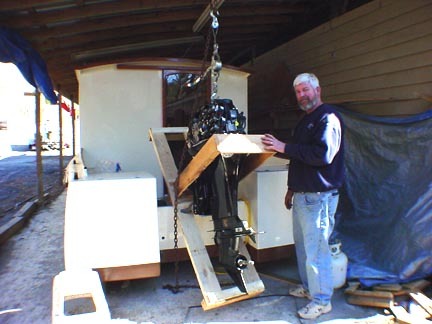 The boat will be hauled to Oriental, NC on Friday, April 9th with (hopefully) a launching the next day if the guy who runs the travel lift will work on Saturday. Sailcraft Marina will be the launch site and we will have a slip there to keep it in. I'll post a time and directions to Sailcraft as soon as I find out. Anyone who is interested is welcome to attend. If all goes well we will take a cruise over the next week as Debbie is out of school at that time. Now that we have a firm launch date it's crunch time. Lots to do and only a finite amount of time to do it in. HELP!! The 60 hp Mercury four stroke motor (engine for my engineer friends) should be in at the dealer tomorrow. We had wanted to go with a Yamaha but the Merc has fuel injection and a bigger altenator so Mercury it is. If the weather cooperates we hope to hang the motor in the next few days. We've been getting snow one day and 60 degrees the next. At least the snow doesn't stay long now. Pictures later this week!! 3/12/04 Another milestone!! Our row boat is now a motor boat. The motor is hanging on the transom. Check out the pictures. I even grew a winter beard and everyone says it make me look "salty". So far the 3 best days of this project were (1) getting the plans (2) turning the hull over and (3) hanging that motor on the transom. The outboard is the biggest single money drain of the whole project and I'm glad it's behind us. I am still waiting for the cables and wiring harness to arrive next week. 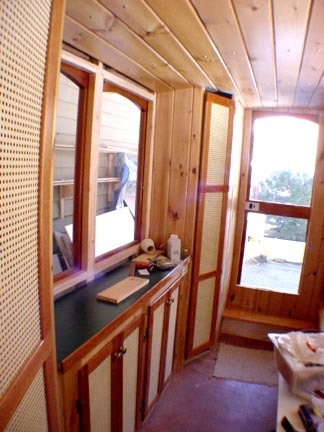 Spent the week getting the front cabin trim finished and getting the stationary windows siliconed in for good. The bed area is next. I will be building sliding drawers for under the bed and the back half of the platform will be hinged to allow access to the water pump and more storage. 3/15/04 Well it's time to break the news now that Debbie has started the retirement process and informed her staff of the coming changes in our life. We have been dealing with the State Dept.of Transportation on the boat shop property and now the house and it appears we will have no where to live for a while until things get sorted out so we decided to take early retirement and go cruising for a year or until we get tired of it. 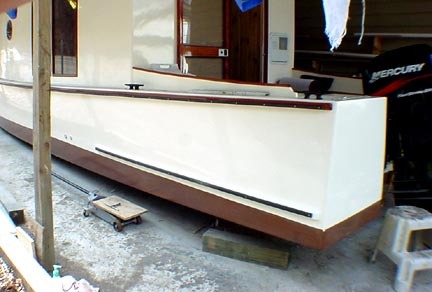 The boat is nearing completion and we have always enjoyed our past cruises so we are going to live the dream. We will be leaving June 1, 2004 and our only plans at this point are to hopefully make it to Ottawa, Canada sometime this summer and then head south in the Fall with Winter in the Florida Keys and then back to North Carolina in the Spring. We also hope to show the boat at the Georgetown, SC. Wooden Boat show in mid October. It's my goal to try and spend a whole year in shorts and 70 degree + weather. If it's a lot of fun we might just do it twice. Debbie wants to finish writing a childrens book she started a few years back and I want to learn to play the gutiar and we should have the time to do both. We have always strayed off the beaten path and it looks like we head that way again. Gotta be happy!! I will have a link off this page to a travel log when we get going and hope to keep it updated weekly. For now though, it's working everyday getting the details finished and prepare for launch in April. Just got back from Boater's World. Picked up the GPS and a shopping cart full of other details to be installed. Installed the propane tanks and lit the stove for the first time. We can cook now!! Finished with the last conections on the water system. Hot showers soon!! 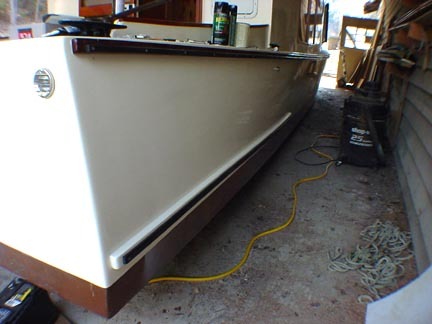 I hope to crank the outboard this week and get the interior done and ready for a final cleaning. The drawers under the bed are finished except for the last coat of paint. It seems there are a thousand details at the end of this project. 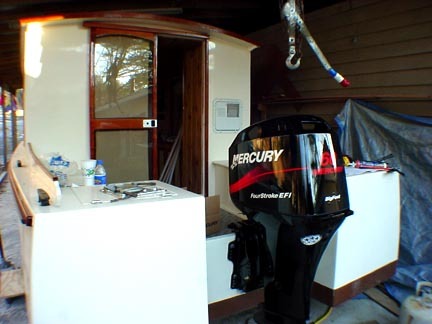 Little things like a transom light, gas soleniod switch, cleats and a lot more. Then there is the unexpected things like the transducer cord being too short to get to the front of the boat. Order online and wait 2 weeks. I hope it arrives in time. Same with the usb cable from the GPS to the computer. It looks like we are going to launch on April 9th in the afternoon instead of the 10th as I had hoped. Some things are out of my control but it will be good to get it in the water and get on with some serious cruising. 3/26/04 Busy as usual. I just got the new laptop computer for the boat going and it's going to be really handy. I think it's going to take some time to get used the the new keyboard. The two most used classes I took in high school were typing and shop. A lot of both on this project! The GPS is installed and working great. The VHF radio is in and I'm getting the weather so I guess it's working as well. The mahogany curtain rods are up and Debbie will get started on the curtains tomorrow. Started the engine for the first time and I love the four stroke design. It has a completly different sound and power range than the two strokes I've had in the past. Can't wait to get it in the water and try it out. Two weeks from today I'll get to find out. Debbie say's I need more pictures so look for some in the next day or two. The new computer even has a slot in the side for the Sony memory stick from the digital camera. I'll have to play with it to see if it works. 3/28/04 New pictures as promised. The shower is complete. The bow anchor platform is on for good. Lower rub rails are on. Finally. I can almost feel the power!! This is the sampson post made out of epi' wood.